Have you ever baked on impulse? Just because you needed a dessert, you decide to make a single cupcake, some cookies, or fallback on a foolproof trusted recipe? I have! In fact I always do! Although permission to bake is heavily dependent on time of the day, daylight hours, people at home and oven occupancy, I try to take full advantage on those available bake-slots. Do you recognize these cookies? Of course you do! Why, aren’t they on the header of my page? It was Hambie’s birthday and I wanted to bake her some portable goodies, so I could send it her way to Toronto! Initially, I started with a cornbread loaf but felt that the loaf alone was insufficient. Layered cake? Nope. It will be destroyed on its way there. You know how I am with my cakes. I look out for their safe transportation as if my life depended on it. The thought of a pretty layered cake flying across the country already scares the hell out of me. But cookies…. 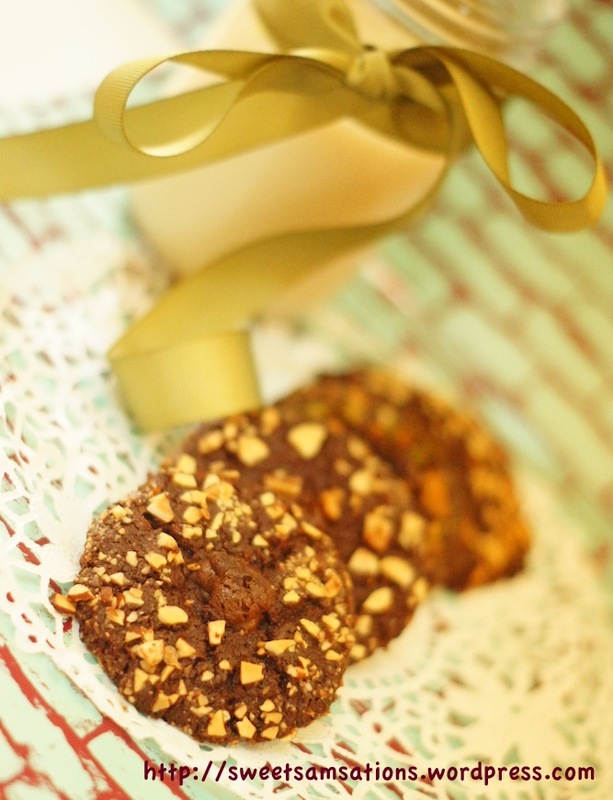 Cookies are the perfect gift for sending your love from afar! 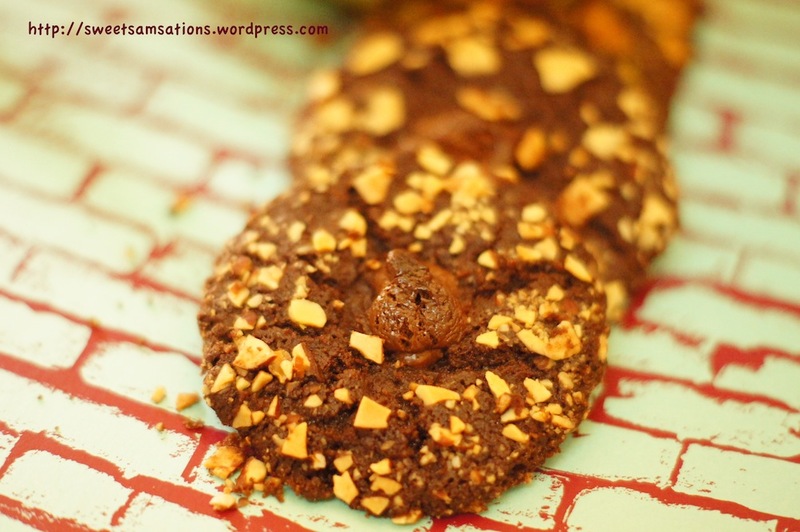 On a whim, I impulsively whipped up some chocolate cookies with crushed nuts. Due to the tragedy that surrounded hazelnuts, I went for crushed almonds / pistachios instead. Initially, I wasn’t sure exactly how I wanted the cookies to turn out. Classic thumbprints? Flat and crispy? Soft and chewy? I had no idea! I just wanted to bake some chocolate cookies! Since I skipped the refrigeration of the dough, the cookies flattened after baking. Okay! Flat and crispy it is!! Combine flour, cocoa powder, and salt in small bowl. Beat butter, granulated sugar, cream and vanilla extract in large mixer bowl until pale and fluffy. Gradually beat in flour mixture until just combined. Roll them into balls and roll into the crushed nuts. If the nuts doesn’t stick, a trick is to brush egg white on the dough and then roll them after. Since we want them to be flat and thin, we will skip the refrigeration for this recipe. Indent the middle and pipe nutella / melted chocolate in the middle. Bake for 9 to 11 minutes. Cool on baking sheets for 10 minutes; remove to wire racks to cool completely. Pipe more chocolate / nutella if desired. Enjoy! But…. Just on Friday, I forked out some of my savings to purchase an air ticket to Switzerland; I was leaving on a plane to Geneva in just 2 days! Whoa! Can you believe it? Yeah, I still can’t. You might think I’m nuts. Heck, I think I’m nuts! I’m already going to Hawaii the week after, yet I decided on the trip on a whim! But visiting Europe has always been a dream! I’ve extensively traveled all around Asia, and some of North America. Yet, Europe is untouched territory. WHY?! Oh, I wish that I could globe-trot like you! Actually, I would just be happy if these cookies globe-trotted their way over to me! Thank you for sharing. Flat and crispy look fantastic! Great looking cookies. Enjoy your trip to Hawaii, I’m looking forward to the posts on Europe. The ideal travelling cookie. The photos make me want to grab one (or two or three) off the page. Cyberspace needs to get real. Haha. Thanks Claudia! Yeah! Cookies are definitely best for traveling! 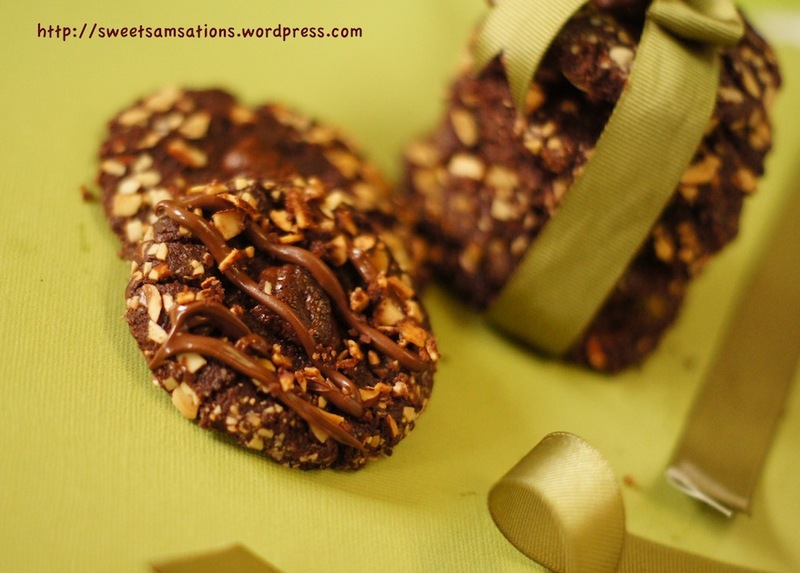 These almond cookies look like a piece of heaven! How good do they look? I would love to try some! My mouth is watering at the sight of them. This looks so delicious! I will definitely give it a try! So exciting! Love the impulse trip! (and impulsive baker should be my new blog name, I’m thinking). 🙂 Love these cookies and happy travels. Haha.. That would be an awesome blog name! Thanks! Wonderful, let the wind blow you to new adventures. Safe travels!! hahah.. Thanks Sandra! Yeah! i definitely had a few pieces myself too. hehe..
I’m usually a chewy cookie gal, but these look great. Can’t wait to try them! Thank you!! Yeah. I kinda love them both depending on my mood I guess! lol. But I do tend to lean towards the chewy! Sam, it is always the sweet tooth that makes me bake on impulse! These look delish! And please, pack me in your suitcase and take me with you to Switzerland and Hawaii. Seriously, you’re going to have a ball. I always believe people should spend money on experiences. Both sound like trips you’ll never forget! Have a great time!!! These do look like a tasty choice for sending to a friend. I am sure that Hambie was delighted with these, I know I would have been. Enjoy your travels, Hawaii makes for a great holiday and I am sure you have some wonderful memories from Europe! i’m definitely an impulse baker – sometimes i just get the urge to cook or bake + decide to whip something up right on the spot. 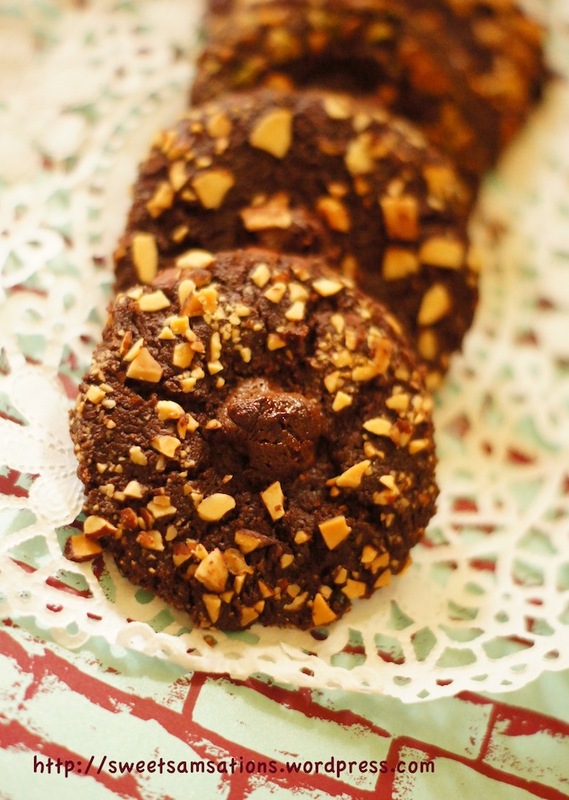 =) these cookies look absolutely delicious + your pictures are just gorgeous! haha.. Thanks Juliana!! yeah. I’m a huge fan of nuts when it comes to baking! Just makes everything so much better! Thank you!! haha.. yeah! Should post up those pictures soon!! Have a great time in Hawaii. Looking forward to reading about the goodies from Europe. must be full of nutty aroma, very tempting indeed! Visiting Europe has been a dream of mine for years..especially France..just for the food to start! I had opportunities, but always passed them over for tropical islands,…ack..what was I thinking? Well..I can’t wait to hear about and see photos from your trip! These cookies are killing me..in a good way. 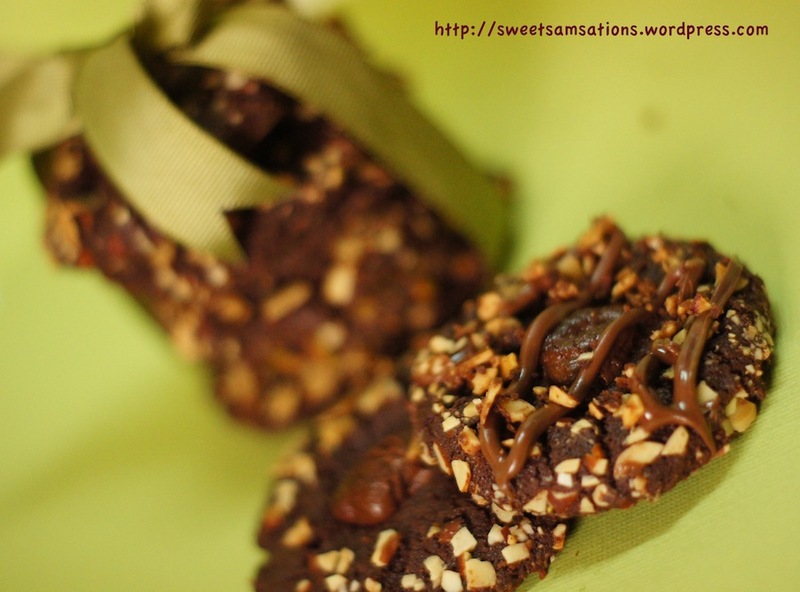 I love all those crunchy almonds all over them! Exactly! Food was so amazing in Europe! But yeah, I’d have to say tropical islands are really beautiful too!! It’s always a hard decision! hehe.. Thanks Lis! I have baked on impulse many many times!! These cookies look amazing. They are a perfect potable treat! Enjoy your travels! Thanks so much!! Can’t believe my trip was already over! Month has passed so quickly and still have yet to blog about it! haha.. These look absolutely delightful! Definitely keeping this in my cookie recipe repertoire. Delicious wishes! 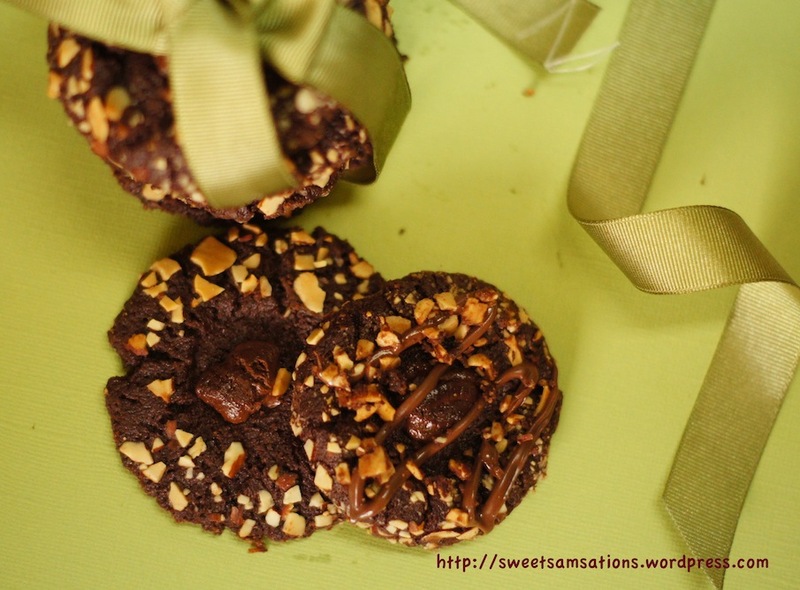 I love the header image and these cookies look scrumptious. I’m too busy to make cookies with the kids lately. But almost summer break and hope to make these cookies then! Oh yes, mailing cookies is far more sensible than mailing cake. And these look so delicious that I’m sure she loved them! What a lovely cookie and recipe. Now this is something I have to try. these are calling my name. I love pistachios in anything sweet!